Check out our speedpaint video above to learn about illustrating and coloring a wing. For this tutorial, we’re using this great reference image from 123RF. It’s very clear and we can see most the detail that matters. Wings and feathers can be quite challenging to paint, but taking it one step at a time and layering up colors it’s very possible. To start, sketch out the wing and roughly place the feathers. These do not have to be perfect. 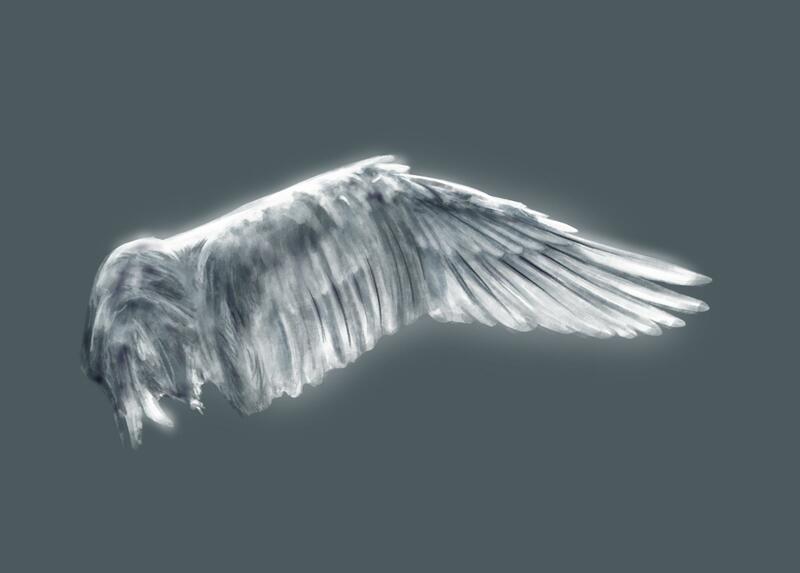 In fact, wings and feathers often more look more realistic or believable when they’re slightly messy and imperfect. Block in the background color (this can be whatever you want, but today we went with a grey-blue to play off the hues in the wings). We used a textured brush for this and most of the painting since feathers are translucent and you can often see light through them. Plus the extra texture adds a nice effect and creates movement. Even when blocking in, be conscious of where the sun hits the wing and fill accordingly. You can start slowly darkening the color you use to begin the shading. As you can see in the video, this method looks terrible until the last few minutes and then it comes together. Remember that the reference is your best friend when painting lighting, be sure to use it and check it frequently. Keep layering over and over again until you’re happy with the overall depth of the wing. You’ll notice that we change the color of the shading around 3:14 and that’s because the cool tones of the background were making the neutral greys look muddy and warm. So we easily change it through the ‘colour balance’ option to a blue-grey. After that, we can start putting in the details and heavier shadows. Keeping building light and dark as you go creating volume and a 3D look to the feathers. Be sure to keep looking at how the feathers interact with the light also each other. They usually overlap each other and create a darkened patch. Try to clean up the edges as you go. Feather edges aren’t usually very messy and their shape quite well. Once you’re completely happy with the wing, make a new layer underneath the one you painted on. Using a soft gradient brush (this one is included in Photoshop’s own brush pack) very lightly highlight around the edges of the wing. This creates an effect that mimics sunlight hitting the wing and bouncing off. After highlighting you may feel that you need to further darken some areas to balance the painting. In the video, we used a slightly more purple color to add some extra dimension. If you use the one color family for the entire painting, it can end up looking a bit boring and flat. To finish, we recommend using the same textured brush as before and slightly erasing around the edges of the wings. The harsh lines can look quite fake and take away from the beautiful shading you’ve done. You can use this tutorial to paint birds, wings or you can add them to people and create angels. Freebies: Download our April collection!